If you accidentally drop any iPhone before the 7 and 7 Plus in water, it’s safe to say that’s the end of your precious device — but not this time. After losing his iPhone 4 while ice fishing in March 2015, Michael Guntrum wasn’t thinking he would ever be reunited with his phone again. When trying to balance it on his leg, it slipped off and fell into the hole he cut in the ice. The lake where Guntrum was fishing ended up being drained, however, which inspired mechanical engineer Daniel Kalgram to go treasure hunting on the empty lake bottom. 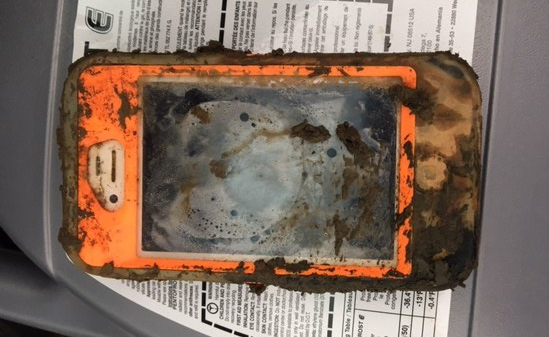 His metal detector then pointed out something hidden under six inches of mud, which turned out to be a lost phone. After putting it in rice and charging it for two days, it miraculously turned on. Even though the screen had visibly suffered, it didn’t take long for Kalgram to find the owner’s contact information on the device. He quickly got a hold of Guntram, who was obviously shocked to find out his phone was found, and arranged to send the phone over to him. The iPhone 4 isn’t water resistant, so the case might have helped a bit in keeping the water out of the phone’s housing. Guntram told BuzzFeed it’s an Otterbox, a brand that’s well known for producing tough cases. This specific discontinued model, however, doesn’t seem to be water resistant. It’s mostly a mystery how the device survived, and I definitely don’t recommend dropping any random phone in an icy lake, but it’s always great to see products performing better than advertised.